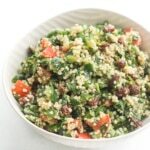 Quinoa Spinach Power Salad with Lemon Vinaigrette: Take a bite into this refreshing, gluten-free quinoa and spinach salad bursting with colourful tomatoes, cucumbers and raisins. In a medium bowl, rinse the quinoa a few times. In a medium saucepan, boil 2 cups of salted water. Add the quinoa and continue to boil for about 10 minutes until the quinoa is tender. Drain the quinoa and let it cool. In a large bowl, combine the spinach, tomatoes, cucumbers, raisins and cooled quinoa. In a small bowl, make your lemon vinaigrette. Combine the lemon juice, olive oil, salt and pepper. Pour onto the salad and toss to coat. Season to taste with more salt and pepper, if needed.